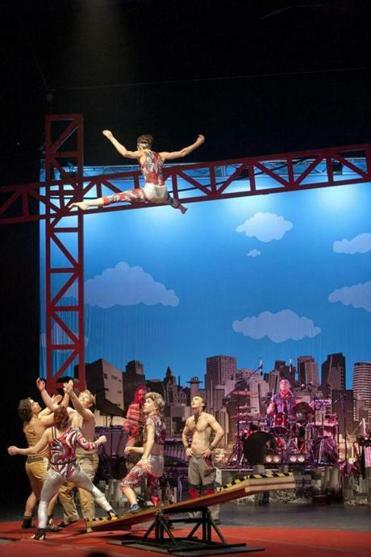 Some high-flying fun by Circus Oz in “From the Ground Up” at the Shubert Theatre. Circus Oz emphasizes attitude as much as acrobatics, which makes an evening with these Australian performers a delightfully entertaining mix of music, comedy, and movement, while featuring an impressive number of gasp-inducing circus tricks. The Celebrity Series’ choice of the Shubert Theatre for these performances creates an intimate feel, especially when the performers mingle with the audience before, during, and after the show. The title “From the Ground Up” sets the scene in a construction zone, inspired by a 1930s photograph called “Lunch Atop a Skyscraper.” A steel girder, large hooks, and some scaffolding frame adventurous routines, including Stevee Mills’s tightrope walk, Mason West’s balancing act on a growing collection of cylinders and a trapeze act, not to mention a set of jaw-dropping human towers and some wild tumbling combinations that feature Kai Johnson-Peady. Because the pieces of the set are designed to move easily, transitions between acts are much more fluid than in most circuses, as the performers continue to “work” in the construction zone: “painting” the girder, climbing up or down, sitting atop, sliding down, or swinging precariously from some scaffolding. Occasionally, the entire company of 10 comes together for beautifully choreographed numbers that serve as a kind of accent to what has just happened. The result is a show that feels like a cohesive evening of theater more than simply a succession of circus acts. Besides the set, the original music pulls everything together, becoming not simply accompaniment for the performers but a central character itself. The core trio of multi-instrumental musicians each gets the spotlight, too, with versatile music director Carl Polke performing a guitar duel against emcee and performer Mark Sheppard, who shreds on air guitar while Polke plays the real thing; percussionist Bec Matthews redefining the drum solo as she swings from a giant hook while playing roto-toms; and keyboardist Ania Reynolds playing a baby grand piano that floats in the air as she accompanies pin juggler Jeremy Davies. 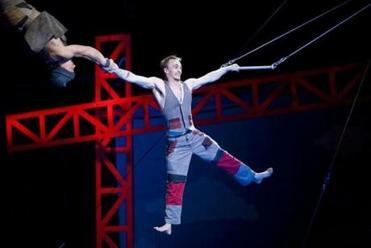 Many of the circus performers also play instruments, which adds to the fun, especially in a routine where each holds an instrument and play the instrument of the person beside him. “From the Ground Up” was inspired by classic black-and-white photos of construction workers balancing atop steel girders. As if this all weren’t enough, there are individual standout acts, including Hazel Bock, who juggles balls, discs, and then a table (! ); Tom Davis, who performs a charming hat-juggling trick; Spenser Inwood, who twirls from a ring suspended high above the stage; and Antoine Carabiner Lepine spinning within a hoop at terrifying speeds. A joyful tone is maintained throughout the proceedings, first set by Jez, a hilarious but clumsy magician with “psychotic powers” (Davies), and amplified by Dez (Dale Woodbridge), who sports an outrageous mullet and prances around, striking ridiculous poses and saying, “Don’t be jealous, be inspired.” The fact that the comedian and the magician also perform acrobatic and musical feats makes Circus Oz feel like a playful company of colleagues whose approach to their work is irresistible.